NORTH-EAST company Survival Craft Inspectorate (SCI) received a prestigious business award yesterday in recognition of technology which prevents unintentional lifeboat launches. 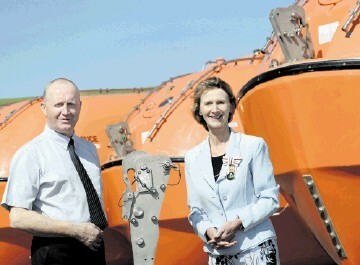 The marine-safety specialist was presented with a Queen’s Award for Enterprise by Lord Lieutenant of Kincardineshire Carol Kinghorn, for its Safelaunch lifeboat-release system. SCI employs some 96 people in its headquarters at Findon, near Aberdeen, and a further 44 split between sites in Norway, Western Australia, Singapore, Malaysia and America. The firm was one of a dozen Scottish companies which won a 2011 Queen’s Award for Enterprise earlier this year. Last month, the company also picked up the Business Success over three years award at Enterprise North East Trust’s Grampian Awards for Business Enterprise.